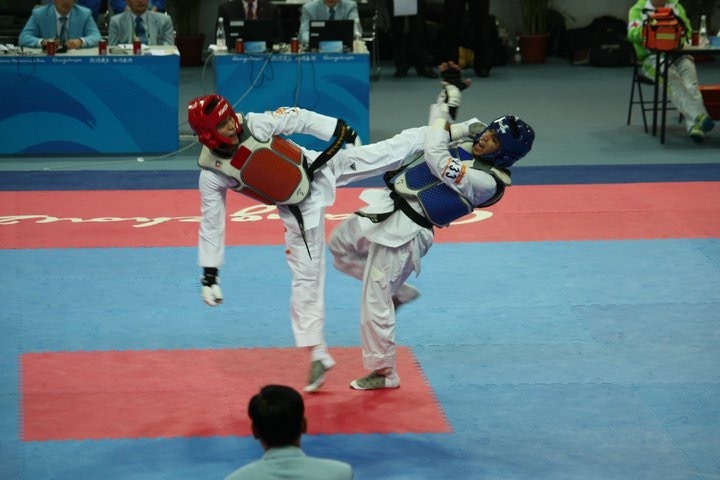 MANILA, Philippines – Japoy Lizardo won his first gold medal in Taekwondo when he was only 11 years old. “It was the first time I ever won an award for sports. I played basketball, I even wanted to become a PBA player, and got into swimming, but Taekwondo was the only sport where I won a medal,” Japoy recalls. He was just a white belter then. A year later, he would already earn his black belt. When he was 12 years old, Japoy joined the Philippine Black Belt contingent, which is the national team for elementary and high school students. He trained everyday during every summer break, until he moved on to join the Junior National Team at 14 years old. He was sent to represent the country in international competitions like the Korean Open and Asian Junior Championships, and he joined the Senior National Team by the time he was 18. By then, Japoy's training has already progressed to a thrice-a-day routine, on top of school requirements. He would wake up at 5 am to make it to his 6 am trainings at the Central Gym in Rizal, Manila. He would go back to training at around 2 pm after attending morning classes, race back to school for his afternoon subjects, then back to the gym for his evening training. During these rigorous training routines, Japoy learned more than just developing his kicks, punches, and jumps. He also developed discipline, perseverance, and his fighting spirit. Although the pressure of being an athlete and joining competitions were there, Japoy never let it get to him. He trained hard and did his best every time he stepped onto the mat. If he didn’t come out on top, he would analyze his mistakes and use what he learned to train better. Competing internationally was a dream come true. “I didn’t want anyone to think that we were not competition. I would think, ‘I won’t go down without a fight.’ I’m a proud Filipino,” he shares. Like any other athlete, Japoy also faced some challenges that went beyond the physical. “It was my ultimate dream to become an Olympian. But I didn’t make it. It was the time when I felt like I wanted to give up. [I though] I’m done,” he says. But his family and friends kept him going. Their support and encouragement was undeniable. “I spoke with my coaches and my family and they helped me through it all,” he says. When he had to train in Korea for about two months, together with the Senior National Team for various competitions, Japoy struggled with being away from his family. “Sometimes you just feel the fatigue and sore muscles kicking in even more because you have no family members with you. I was young then. I had to learn how to take care of myself,” he shares. When asked what kept him inspired, he says it was the support from his family as well as from his coaches and teammates. “When you’re so tired, you tend to question if you can still go on, especially when your body hurts after training. But that’s where I had to be stronger and more positive. My teammates encouraged me and my parents would tell me that I could do it because they believed in me. It’s what kept me going. I chose not to give up because I wasn’t only doing this for myself but also for my family, my friends and the country,” Japoy shares. Their support was from start to finish. Back in the Philippines, his parents would continue to bring and pick him up from training, his siblings would cheer him on, and his teammates always encouraged him to push himself harder. As the good times encouraged Japoy to keep on fighting, he also knew that it would eventually come to an end. In 2015, he finally decided to retire from the sport after his hamstring tendon broke and he had to undergo surgery. Even if he does not compete anymore, Japoy is still pursuing his love for the sport by teaching and coaching. He says that what he loves most about his current job is being able to witness his students excel in the sport and become better individuals. Just little over a year in his coaching career, Japoy already feels very proud of what he and his students have accomplished. Children need to energize both mind and body throughout the day. Help them reach their full potential on and off the court with proper nutrition, exercise and a balanced lifestyle.